Wild violet, one of spring’s many welcome signs that fancy up the grass with vibrant little lights that shine purple and lavender and the faintest shade of violet-white. You might find them growing in grassy meadows or sprinkled about the forest floor, and you can also find them on the side of the road, and anywhere really, where grass and weeds are prone to thrive, for that’s technically what they are. But these purple perennial weeds should be far from overlooked, for they offer tremendous value to both the natural world and to human beings. They provide nourishment for hungry butterflies, and can be turned into myriad of goodies if you’ve got a pinch of time to spare to celebrate them. Stella and I took to the patch of land just beyond our backyard last Friday and spent a good chunk of our morning together separating hundreds of flowers from hundreds stems, tossing them in woven baskets as we went along. If you want to learn something about your child or are wondering how their insides are doing: go pick flowers with them. 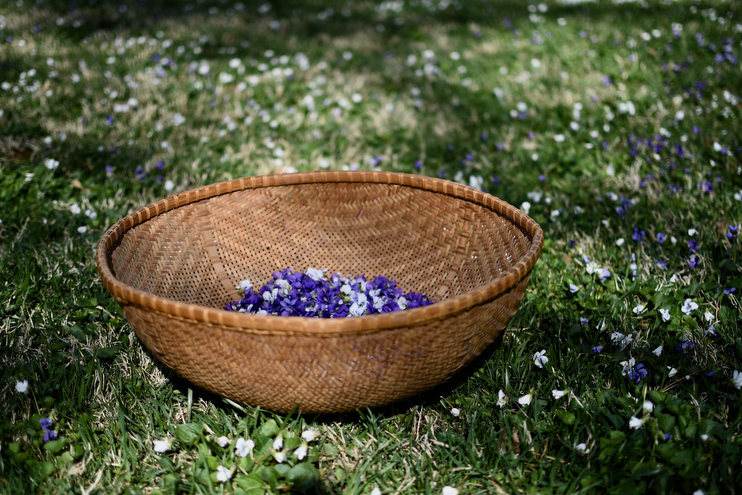 Sit alongside their tender souls in a large patch of grass and pick wild violets with your hands busied and ears open. No need to ask questions, for it’s likely they’ll just dive on in and open up like the flowers their picking. Friday’s are Stella and my day together. Well, the boys too. But I really try to focus on doing something for just her and I on those days, leaving room for wandering and exploring to take us deeper into curiosity and creativity together. We didn’t plan on making candies and lemonade out of wild violets that day, but somehow they sang to us, and because we kept our ears open we heard them. Soon enough, ourselves surrounded by their beauty with baskets to collect petals and memories. We had fun tinkering around with this versatile weed both that day and the next, and ended up with several delicious snacks at the end of our efforts. Below are four ways to use wild violets, picked and sampled and savored by yours truly, plus my sidekick, Stella. To prepare, heat water in a sauce pot, and once it begins to simmer, turn off the heat and add the violets. Stir well a let the violets soak for 24 hours before continuing the process. Strain and add the juice of 1/2 a lemon, and this will turn the color from blue to purple! If you don’t want to add the lemon, that’s ok, but your syrup will be a muddy hue if left out. Once the lemon is added to the violet infused water, add sugar to the pot and stir constantly over very LOW heat until the sugar is dissolved. Do not simmer or boil, for this will result in a loss of color. Once cooled, store in a glass jar. Will keep for 1 month if refrigerated. You can use this syrup in tea, coffee, cocktails, in frostings, on pancakes, waffles, or in lemonade, see below! To prepare, fill each glass with ice, and 2 tablespoons of Wild Violet Simple Syrup. Squeeze in 1/2 of a lemon, and fill with water. Garnish with flowers and lemon. To prepare, paint each fresh violet petal with egg white using a small paint brush. The fresher the violets the easier it will be before the wilt. Once painted, dip the flower in cane sugar, and lay on parchment paper on a baking sheet to dry. Let dry for 24 hours before eating. You can eat candied violets all by themselves, but they are also delightful on cakes, cookies, muffins, and other seasonal sweets. To prepare, fill a Mason jar to the top with violets. Once filled, pour vodka over the flowers until they are submerged. Put a lid on the jar and shake daily for several days, up to one week. Strain and store in amber glass dropper bottle in a dark place. Will keep indefinitely. 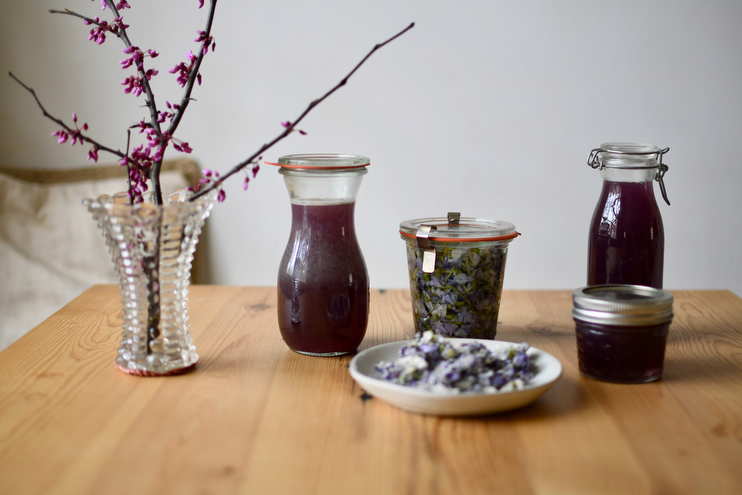 You can use wild violet tincture infusions in a variety of drinks for both medicinal use and deliciousness. Add a few drops to a gin and tonic, or several to a glass of sparkling water. 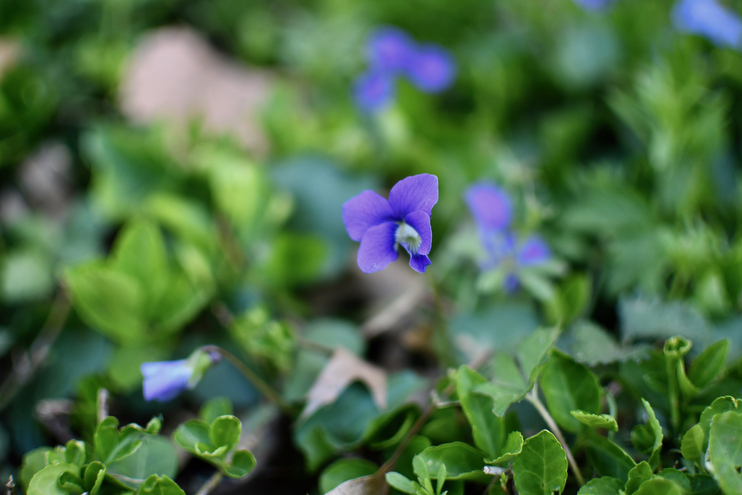 Wild violets raw are a fantastic addition to spring salads. The flowers themselves have been eaten for centuries in the spring, a common weed that keeps on giving. Add them to ice cubes for a fun drink idea, press into cookies and bake, or sprinkle on top of your favorite chilled soup. There are many ways to enjoy this wonderful spring plant, and if you do a bit of research, you’ll find that the leaves are edible too! Know the ways of the ones who take care of you, so that you may take care of them. Take only which is given.